As part of escalating struggle over Judaism's holiest site, Muslim leaders lift ban against visiting to bolster Muslim presence. Muslim leaders in the Jordanian capital of Amman on Wednesday issued a "fatwa" (religious edict) ending a ban on visits to Jerusalem's Al-Aqsa Mosque, despite it being "under Israeli occupation." The ban had been in effect so as not to aid the "Israeli occupation" by contributing to the Israeli economy through tourism. That was overturned in the "Road to Jerusalem" conference, according to The Jordan Times, but with wording that left a clear prohibition against supporting the "occupation." Those now allowed to visit the mosque, which is the third holiest site in Islam, and sits on the ruins of the First and Second Temple on the Temple Mount, the holiest site in Judaism, include two groups. The first are "Palestinians wherever they may be, in or out of Palestine and regardless of their nationalities"; the second group now allowed to visit are "Muslims with passports from countries outside the Muslim World." The motivation of the new religious ruling is clearly political - part of an ongoing struggle between Muslim groups seeking to Islamize the Temple Mount and deny Jewish access, and Jewish groups who are campaigning for more rights on what they point out is their own holiest site. Speakers at the event claimed "there are currently plans by the Israeli government to divide Al Aqsa or to demolish it and an influx of Muslim pilgrims lends support to the concerns of Jerusalemite Palestinians." Despite their assertions, Jews this week continued to be discriminated against by the Jordanian Waqf which manages the site, as Jews were forced to wait on lines for hours to enter while Muslims entered freely. MKs at a conference held on Tuesday in Jerusalem pledged to change the situation and allow Jews free access to visit and pray at their holiest site - which they are currently banned from doing in what Temple Mount activists have attacked as capitulation to Islamist threats. The new fatwa makes clear that any Muslims visiting Jerusalem must do it in such a way that does not lead to "normalization with the occupation." It demands visitors to support "Palestinians and not the occupiers" in practical terms, by only spending their money at Arab-run hotels, stores and modes of transportation. "Jerusalem belongs to the Jews"
Despite the ruling, not all Muslim scholars agree with the campaign to deny Jews the right to ascend the Temple Mount. Italy's most prominent Islamic scholar, Sheikh Abdul Hadi Palazzi, has long pointed to the Koran itself as a source for Jewish rights to the Land of Israel. A recent widely-publicized Islamic ruling by a Muslim scholar in Jordan, Sheikh Ahmad Adwan, echoed those sentiments, pointing out that "the direction of prayer of the Muslim people is to Mecca, and the direction of Jewish prayer is to Jerusalem. ...According to our faith, Allah promised Israel to the Jewish people, and they are the sole official inheritors of that land." Similarly, Adwan said in February "there is no such thing as 'Palestine' in the Koran. Your demand for the Land of Israel is a falsehood and it constitutes an attack on the Koran, on the Jews and their land. Therefore you won’t succeed, and Allah will fail you and humiliate you, because Allah is the one who will protect them (i.e. the Jews)." 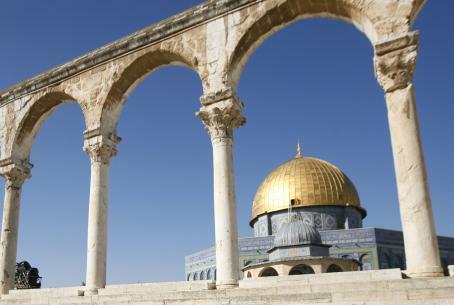 Despite a peace treaty with Israel, the Kingdom of Jordan's own stance, however, is to categorically deny Jewish rights to the Temple Mount. When Muslim rioting broke out on the Temple Mount last month, as Islamists sought to prevent Jewish groups visiting during the festival of Pesach (Passover), the Hashemite kingdom chose to blame Israel, accusing it of "provocations" after Jews were temporarily allowed on the site. It also urged the UN Security Council to get involved.